While waiting for our orders at Ton-Chan Ramen - San Gabriel, Gourmet Pigs brought out a wasabi-flavored Kit Kat she picked up at the airport in Japan. It's been a while since I've done a fun food post, so thought I'd share. 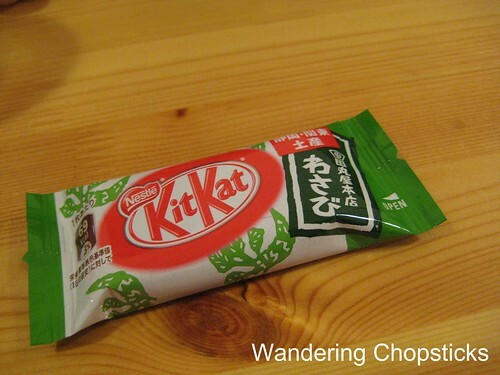 We split the mini Kit Kat because while I was intrigued by the concept, I really didn't know if I'd want to eat a whole bar of wasabi-flavored chocolate. 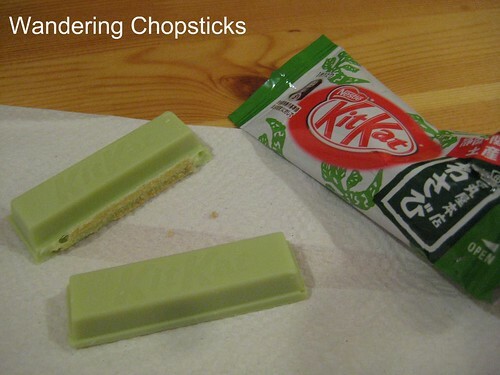 From appearances, it almost looks like a green tea Kit Kat, but the taste clearly indicated this was wasabi. Just a light kick, so it wasn't overpowering. Anyway, fun to try. Have you tried any other odd Kit Kat flavors? Apparently, there is a whole slew of them. 2 years ago today, Best of: Top 10 Recipes of 2006. 3 years ago today, Spanish Chickpeas with Raisins, Sausage, and Walnuts. 4 years ago today, best of 2007 recipes from aji verde (Peruvian green chili sauce) to butter. 5 years ago today, two of my cousins started quilting too. A friend of mine gave me "cheese" kit-kats. they smelled cheesy and tasted awful to me. my husband, on the other hand, enjoyed it. Uh, yeah, I don't know about cheese and chocolate. Well, when it's not part of a wine pairing. there wasn't any chocolate in it, from what i remember. the outer coating was white (white chocolate?) but i couldn't get past the smell. it wasn't cheddar cheese but some really gross stink feet cheese smell. White chocolate is still chocolate. Hmm. Do Japanese like stinky cheese?